A vintage film clip reveals people on the bathing beach at Atlantic City. A Library of Congress vintage film clip reveals the bathing beach at Atlantic City, New Jersey in 1901. The camera position was from a tower or some platform high over the heads of the people on the sand adjoining the water allowing for a clear view of the scene . The camera captures hundreds of people sitting on the sand between the boardwalk and the ocean, part of the boardwalk, and a great deal of the ocean area where people are swimming. 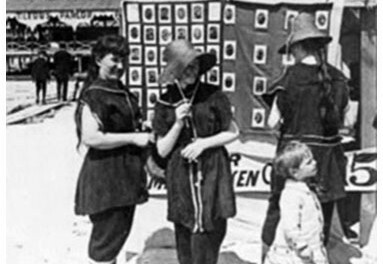 This is a fun look at “real” people from over a hundred years ago in their turn-of-the-century bathing suits and other summer clothing. In order to truly envision the fashions of the past, we need to examine period photographs.